My Jurassic Farm is the latest title in the My Farm series developed by bip media and released on the Wii U eshop! The series is a farm simulation title that is meant for young children therefore most adults or older children might not find this game enjoyable. The other games in the series fell short of solid status, but each new entry has been slightly better than the previous one so does My Jurassic Farm continue this tradition? Let's find out! My Jurassic Farm continues the tradition of recycling the gameplay from previous games in the series, however in-terms of overall content the game has more than the previous two titles My Farm and My Exotic Farm which the reviews for those games can be viewed by clicking the links that are located in this article! 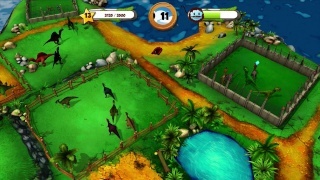 The other difference in the gameplay is that you can raise dinosaurs in your farm! Yes, even T-Rex's! Which young children will likely find extremely cool! This game also lacks Off-TV play just like the previous games, but the controls are responsive and work very well! The Graphics have once again been improved and the soundtrack is much better this time around! With solid gameplay, smooth controls, and a decent soundtrack My Jurassic Farm is a solid game that should be entertaining for young children. The graphics have also been vastly improved this time around as well, the only serious negatives are the lack of Off-TV play and that nothing substantial has been added to the gameplay formula. If you have a young child and haven't already purchased a game in the series we'd definitely recommend this one if they like farming or dinosaurs! I love the Jurassic Park reference in the tagline! Seriously a 7/10? There's a reason why dinosaurs became extinct and this is one such reason.